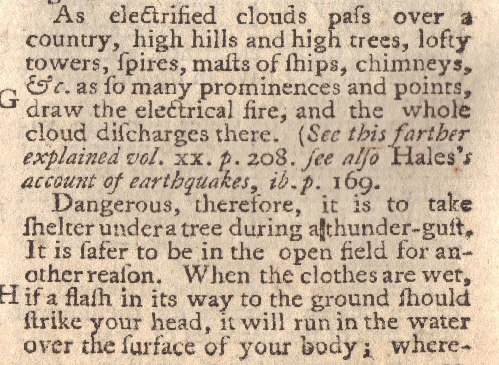 The highlight of this May 1752 issue of Gentleman's Magazine are excerpts from Benjamin Franklin’s famous 1751 book on electricity and lightning (now selling for over $60,000) and an early report of French experiments confirming Franklin’s hypothesis that static electricity and lightning were the same matter, and on a practical level, “thunder clouds may be deprived of their fire by iron bars.” The Franklin electricity book was published by Edward Cave and publisher and editor of Gentleman's Magazine and it was republished later in America and translated into French and other languages. 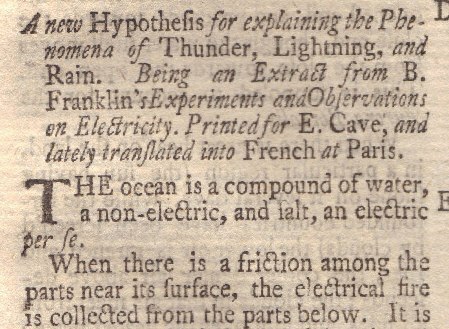 This became the basis for Franklin's international fame for the lightning rod was such a valuable innovation throughout the world. 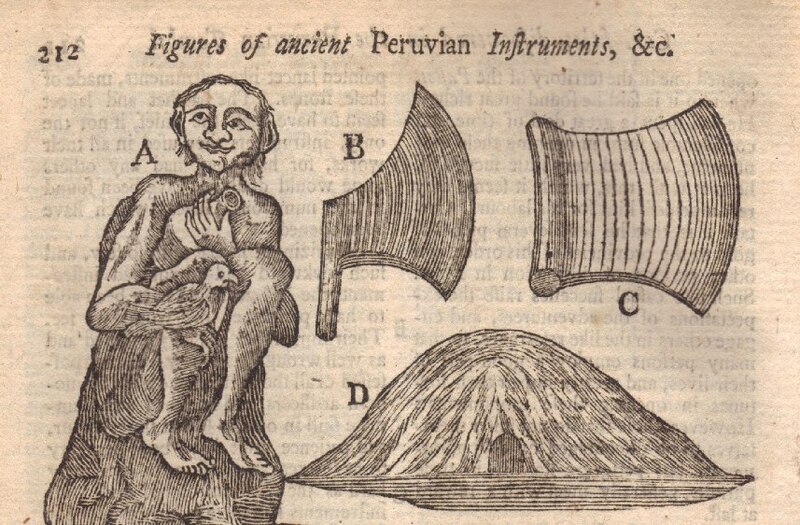 Below are three pictures of portions of the historic entries in this issue regarding Franklin's ground breaking experiments and their following in other countries. 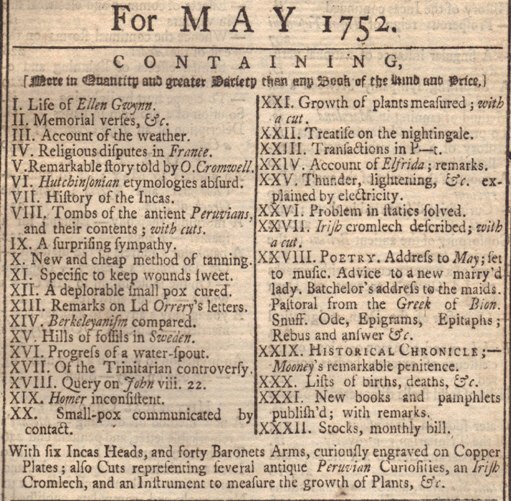 Below is the index from the title page of this issue showing the other subject addressed. 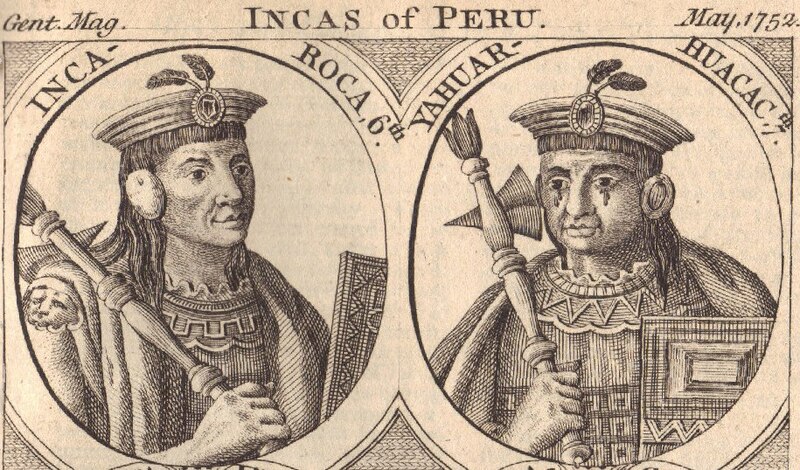 Below are the engravings relating to the history of the Incas of Peru contained in this issue. 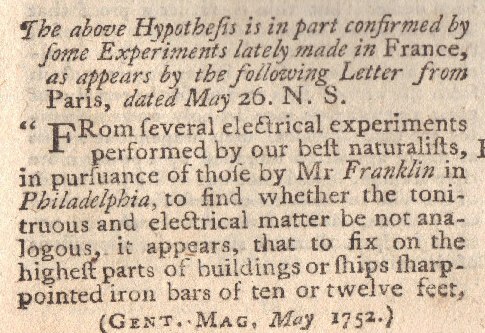 The Gentleman's Magazine, because of its relationship with Peter Collinson, Fellow of the Royal Society, who was Ben Franklin's early and regular scientific correspondent and it role as publisher of Franklin's electricity book, is an unparalleled repository of contemporaneous articles on Franklin's historic electricity and lightning experiments. 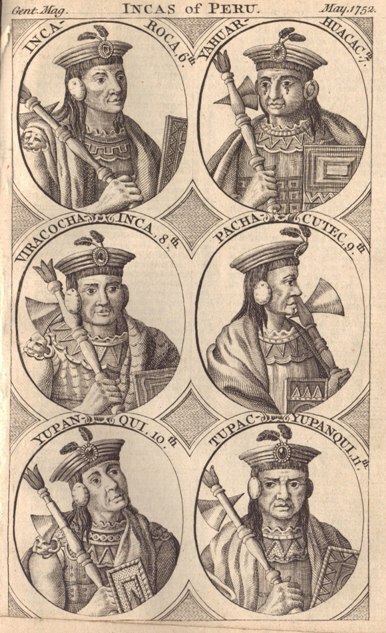 Here the magazine makes use of its access to the manuscript to publish early excerpts from the book and reports on some of the international reception for the findings. 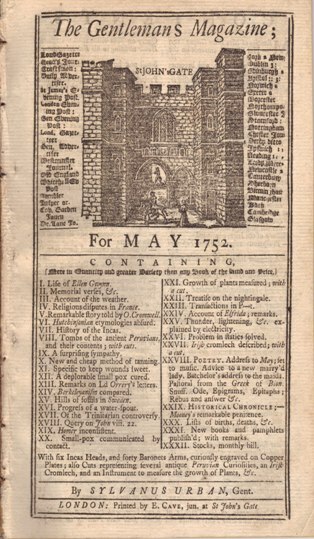 This issue is disound, complete and in fine condition.